Do you see Him as on that day of heaven’s eclipse when He did ungird His majesty? Oh, can ye conceive the yet increasing wonder of the heavenly hosts when the deed was actually done, when they saw the tiara taken off, when they saw Him unbind His girdle of stars, and cast away His sandals of gold? Can ye conceive it, when He said to them, ‘I do not disdain the womb of the virgin. I am going down to earth to become a man’? Can ye picture them as they declared they would follow Him! Yes, they followed Him as near as the world would permit them. And when they came to earth they began to sing, ‘Glory to God in the highest, on earth peace, good will toward men.’ Nor would they go away till they had made the shepherds wonder, and till heaven had hung out new stars in honor of the new-born King. And now wonder, ye angels, the Infinite has become an infant. He, upon whose shoulders the universe doth hang, hangs at His mothers breast. He who created all things, and bears up the pillars of creation, hath now become so weak that He must be carried by a woman! And oh, wonder, ye that knew Him in His riches, whilst ye admire His poverty! Where sleeps the new-born King? Had He the best room in Caesar’s palace? Hath a cradle of gold been prepared for Him, and pillows of down, on which to rest His head? 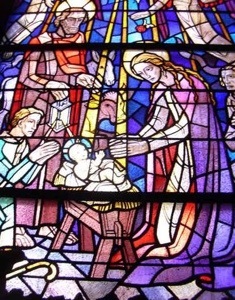 This entry was posted in Uncategorized and tagged Bethlehem, Christ, Christmas, nativity by marc mullins. Bookmark the permalink.